Hi friends, and welcome to my May Giveaway! But first I have to tell you about my new bag. *There is an error in the book for the larger sized Teardrop bag. If you want to make this bag, check out the correction for the pattern on this page. *I followed the pattern for the handle and it turned out too narrow for my tastes, so I made another one and widened it. *I found some good tips on inserting magnetic snaps here. I used 2 layers of interlock knit to reinforce the snap pieces, instead of fleece. My phone fits just right in that center pocket. *The strap. I lengthened the strap so I could wear it cross-body but I don't think I got it quite right. Someday I need to figure out how to make an adjustable-length strap. *And, I used sewn-in interfacing on one side of the strap and added some sturdiness by using a layer of twill fabric in place of interfacing the other side of the strap fabric. I like all of these... but I LOVE the text fabric, and the dragonflies are my favorite, too! The large floral in the top row is also super pretty. 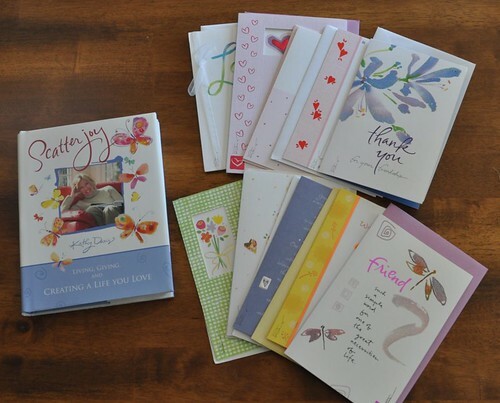 Also included in the giveaway is the book Scatter Joy, along with a pile of gorgeous greeting cards, all by Kathy Davis as well. To enter the giveaway, please leave a comment below (one comment per person.) I'd love it if you tell me something interesting, but it's not required. :D I will choose the winner via random number generator on May 25, and the folks at Kathy Davis Studios will mail the prize to the winner. Don't forget to make sure I have a way to contact you! If you are a no-reply commenter, include your email address in your comment! Now, go enter more giveaways at Sew, Mama, Sew! All of the fabrics are beautiful! I do love your bag. The fabrics are all so pretty! I love the bag too. An adjustable strap would be great to learn to do! Something interesting? I've entered the Giveaway day too for my first giveaway on my blog. It's kind of exciting! Fun giveaway and your bag looks great!!! Hmm ... Something interesting - I didn't realize my middle and my last name would be he same till after I got married! Love the bag and I appreciate the 'notes'. I am thinking of making a camera bag and these tips may come in handy. Something interesting? I am starting a vacation on Thursday! Well, interesting to me, anyway! Live your bag, I've been looking forward to making that one so thanks gor the great pattern review, I'll be reading it again for tips before I start! Fab giveaway too!! Beautiful fabric and cards! Thanks for the chance to win. Something interesting...my married name is England and my mother's maiden name was Ireland. I'm also from Kansas and am a Pizza Hut brat. My dad is a franchisee and I work for him now. 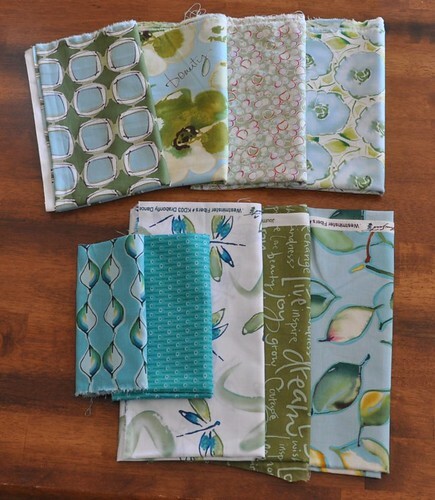 My sister is collecting dragonfly fabrics so I would share those (pat on the back) with her, and make a bag for myself! Thanks for all those helpful tips and the chance to win! I am putting together a king size quilt with different block sizes and therefore, different sashing sizes. It's kind of a pain, but perhaps better than cutting off the points on all my pinwheels. I live in Amish country. In the same mile on my road are 14 Amish families. It's really a different way of life. Thanks for the great giveaway! I like your bag and the fabrics are very pretty! My youngest just graduated from college on Sunday. I'm going to be "rich" again. hahaha. Beautiful bag! Thanks for the opportunity to enter your giveaway!! Your bag is just great. I know what you mean about handles. I recently made a cute bag with darling purchased handles. After using it I replaced the handles with a shoulder strap, more my style. I love the fabric. some thing interesting is that I joined an on line dating service this weekend. I think your bag turned out really cute! Great bag! Thanks for the chance to win the fabrics! What lovely fabric! I have an addiction to buying fabric - I just can't help it! Your bag is lovely - have you checked out the Bag Making Bible - it's fabulous. I'm loving these fabrics but I've never seen them before! The most expensive swimsuit in the world is a bikini that is worth $30 million dollars. Designed by Susan Rosen and Steinmetz Diamonds, the bikini is made with more than 150 carats of D flawless diamonds which are all set in platinum. Great job on the bag. Haven't attempted anything like that yet. The colors are beautiful! Gorgeous bag and awesome fabric. Thanks for the chance. Something interesting, hmmmmm . . . I'm a fellow cougar alum (at least I've noticed your boys in cougar gear on the blog). Your bag is fantastic, even in it's worn-in state & your review/critique of the pattern is great. These fabrics are lovely & I would love to win. Thanks for the giveaway. So good to see a bag that has been used and still in good shape! Hi! I'm new around here.. and to quilting but i'm good in sewing.. still on the singer my mom gave me 15 years ago!! I use to do pattern grading work! Now i do only creativ work!! Lovely giveaway! Love the fabrics, especially the text one. Your bag is so cute and I love the fabric! I love Amy Buttler and I have made on of her bag's. I'v carried it all summer for two years and it is starting to look pretty sad I really need to make a new one. You should be a pattern tester-your hints were great. I get a little fed up when I'm using a pattern, and it doesn't come together so great & I need to make changes! I'm not familiar with Kathy Davis so thanks for the links-the fabrics are really nice! Those fabrics are just gorgeous--I'm sure they are even prettier in person. Can't think of anything interesting, feeling kind of worn out. I went to bed late, and then woke up in a total panic because I was sure I had overslept. Jumped out of bed, hopped in the shower, when I got out I looked at the clock. I had woken up at 4:15 AM, when I didn't need to be out of bed until 6:30. Wow! FAIL! Got all the chores done though, and now I can play on the computer! Not too interesting, but it's all I have on this Monday morning. did you know that a sparrow has three times as many neck bones as a giraffe? 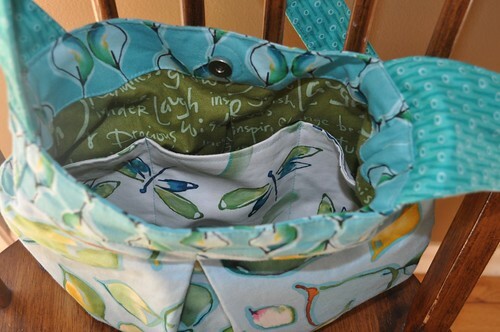 The bag is beautiful - you did a great job and I LOVE those fabrics! I am a handquilter and have been for 12 years and just now venturing into purse making and I love it! Love how fast they work up and I've learned that quilting fabric works on purses as well as quilts! Have a great day and Happy Stitching! Lovely fabrics! I made the teardrop bag for my stepdaughter and she loved it. Just the right size for running around on the weekends. Thanks for the giveaway! Lovely bag! I've never used an Amy Butler pattern - are they easy? I made a huge Paris Bag from Fig Tree and the directions were wonderful. Interesting fact of the day: Karoke means "empty orchestra" in Japanese. I love the fabric you are offering and think the bag you did is crazy inspirational. If I won I'd definitely be thinking of making one of my own. Thanks for the great fabric selection in the giveaway! An adjustable strap would be a great idea - maybe for a simple one you could use D-rings attached to one side of the bag, to pull the strap through? Cute bag! Something interesting...My doggie (who normally hates being in the rain) apparently thought the joy of rolling on bugs outweighed her dislike of being wet. So now I have a wet, stinky dog. Sleeping on the quilt I had just finished and washed. wow! such a pretty bundle! thanks for the awesome giveaway. I am so terrible at bag-making! Love your's! I would like to make a keyboard cover with the fabric. We have somewhere around 20 guitars and 4 keyboards and microphones and amps and a ukulele. I would like to make some sort of dust cover for each of them, eventually. Thanks for the fabulous giveaway! I would totally make my daughter a skirt with this fabric! She's tiny so I could make many! I am commenting from "The Loveliest Village On The Plains!" War Eagle! You're right, the dragonfly fabric is really gorgeous ! I'd keep it for myself if I were you ! Gorgeous fabrics! Something interesting...I am wondering if I can somehow move my crafting room outdoors this summer, becuase I looooove sitting at my sewing machine, but also love sitting in the sunshine. There's my random thought for the day! Thanks for the chance to win! It's so hard to think of something interesting on the spot! Thanks for the giveaway, though. As I am sure you know, typer's elbo is real! That's a great selection of fabrics. Count me in please. Beautiful fabrics! Thank you for the chance to win. Something interesting that is always a conversation starter for me when I travel is that I live in Alaska. Your bad turned out great! Thanks for the giveaway opportunity! What a fun pack of goodies! I can never think of anything when asked to share something interesting, so I'll share a favorite joke of my son's. Q: What does a cow say when he's climbed to the top of a mountain? Interesting, eh? I have always used universal needles for sewing cottons and for piecing, but I found out that sharps (or denim needles) are actually the recommended needle for woven fabrics because the sharp point finds its way between the fibers without punching a big hole. Universal is kind of an in-between type needle that isn't the best for anything, so I'm using up my current stash and then I'm gonna switch over to sharps. wow. those fabrics are very pretty. i love them. Love them all! Thanks for hosting such a great giveaway. I'm expecting a baby girl this fall, so for every giveaway I enter today I am thinking of all the beautiful things I could make for a baby girl. I think that these pastel blues and greens look especially lovely on little girls. Thanks again! I'm finishing my teaching degree this summer and am loving the extra time I have to craft. My mom and I are starting a quilt and I'm crocheting and sewing up a storm. Love these gorgeous fabrics! Gorgeous giveaway! Something interesting...I only sew barefoot, gotta feel the pedal! the sky appears blue do to a phenomenon called Rayleigh scattering. something interesting...after 4 years, I'm finally making our master bedroom 'ours' by hanging things up, getting a few pieces of furniture to complete it, and purging all the 'stuff'. I look funny sitting here trying to type with a huge bandage on my hand thanks to stitches.. I'm rather boring, and can't think of anything truly interesting to say. So instead I'll waste your time with my favorite "chicken" joke. That fabric is beautiful. Something interesting makes my mind go empty. O.K., there was a hummingbird here, since that is only the third time I've seen one, I think that's interesting. Thanks. Those fabrics are so beautiful. Thanks for the chance! Hmmmm, something interesting. Did you know that the first potato planted in the US was in 1719 in Derry, New Hampshire? I have a new Husqvarna sewing machine that I love! Thanks for a chance to win your goodies - great bag! Something interesting... Hmmm... I used to live on a tiny peninsula where all you had to do was walk for 15 minutes and you'd be at a beautiful sandy beach. Hmmm interesting comment... did you know tarantulas could become as big as my husbands hand? (Shudder)... Great fabric bundle! Just learning to make bags, so excited! All I can think about right now is how yesterday our tennis team was in the City Finals in Atlanta. We came in 2nd but it was an amazing experience with lots of supporters there and of course, it was over 90 and humid! I have recently started making bags from recycled clothing and bits and pieces I find- mostly for my own amusement but perhaps I will make millions selling them one day. You fabrics would be lovely additions to my creations. What lovely fabrics and cards! Thanks for a chance to win some, and for letting us know about Kathy Davis. Those fabrics are beautiful. I love your bag and appreciate your thoughts on it. I just loved the bag and the fabric is lovely, i hope i'll win!!! something interesting: i meant to finish a book that i was reading but ended up entering give aways ALL day long!! Just lovely fabrics- beautiful colors!! Gorgeous fabric in your giveaway! Something intersting...you can remove black sharpie marks from your laundry dryer drum with finger nail polish remover. Thanks for a chance at your giveaway. What gorgeous fabrics! I love Kathy Davis cards. The verses are lovely and the artwork is so pretty. Thanks for the opportunityto win. What a wonderful bundle to win! Thanks for the chance to enter. Wonderful fabrics. Thanks for sharing!!! Wow it was along way down to get to the comment box;0) Love these beautiful Kathy Davis cards and fabric and would love a chance to have a closer look! Your bag is delightful Vicki. Those fabrics are gorgeous. Not very interesting, I know, everybody's saying it. Here's the interesting thing: I'm doing a presentation at a 10,000+ attendee academic conference this fall about prayer shawls! I havent seen that fabric before, and I love the dragonflies. I absolutely love painterly fabrics. These are gorgeous. I love the fabrics. I've never seen them before, but love the look. Your bag looks great also. I don't know if this qualifies as interesting, but I'm embarking on a new sewing project soon. I'm going to attempt to make a whole set of crib bedding for baby #3! Thanks for the giveaway opportunity! I'd be happy to win this lovely prize! I'm doing my own giveaway today and it's been so much fun reading all the comments that I almost forgot about entering the giveaways! Haha! The bag is wonderful! And the fabrics are yummy! Awesome giveaway! Those fabrics are gorgeous. 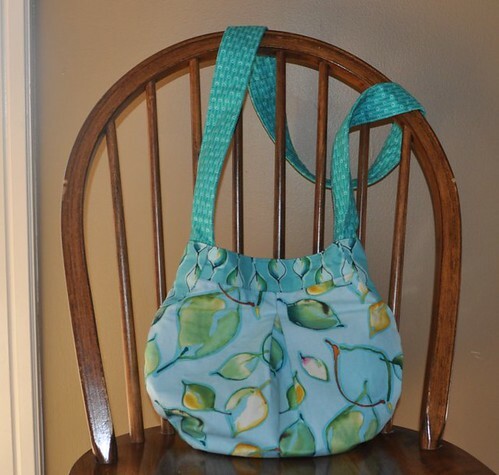 I made a few purses recently, too, and decided that stiffer interfacing would improve them. I also learned that aligning magnetic snaps is much easier if you attach the snaps, close them, and THEN sew around the lining (all but the opening for turning the bag right side out). You may already know this trick, but I really loved learning it! What a grand giveaway. And I love the blocks in your previous post. The fabrics are beautiful and you did an amazing job on your bag! Wow - thank you! A generous giveaway! The fabric on the bottom second from the left would be a favorite of one of my kiddos! Something interesting hmmmm, my dog's name is Scruffy, we named him, then decided to go buy him, found him, he looks like Toto. I love your bag. I think spring and summer bags can be a little floppy. I love the selection of fabrics. 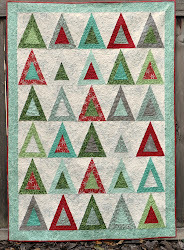 I am just starting to follow several quilting blogs and I love this sense of community. I hope it continues. Thanks for hosting such a lovely giveaway. Gorgeous fabrics! Something interesting - oh the pressure... I just started making bags and I really enjoy it, but I find it hard to be motivated to sew in the summer. Thanks for the giveaway! This is a new designer to me. I really love that fabric with the writing on it. My daughter and I are making camera bags. This would be great fabric for those. I think the camera bag pattern has those adjustable straps. We are just cutting now, so sorry I can't share how to do that. I think it has to do with rings. Amy Butler fabric is what lead me to sewing... and her nappy bag was the first pattern I ever sewed! Thanks for the giveaway! Thanks for the giveaway. Something interesting . . . I love bubble wrap and bubble wrap just turned 50! Thanks for the lovely giveaway! I don't know how interesting this is, just some random info about me... but in 2 weeks I'll be moving to a town that was just destroyed by an EF-5 tornado. Hoping to help rebuild. Thanks for the giveaway. Love the fabric you chose. Thank you for the giveaway. It is lovely. I am so sleep-deprived that I can't think of anything interesting to say. Oh the joys of having a baby and a toddler (although it's the toddler who's creating the sleep deprivation these days!). Beautiful fabric and cards! I need to make some bags myself--thanks for the review, it helps! Thanks for the tips on the pattern it is always nice to learn from someone who had already done the pattern. I love cheesecake and fabric. I hate my scale (cause I love cheesecake). My pocketbook hates me (cause i love fabric). something interesting??? now that's a pretty hard answer. i'm really deeling the pressure and I can't think of anything. I'm sorry. My parrot interrupts me when I talk. Thank you for a great giveaway! What a great giveaway! I love the fabric. Your right, the word-fabric is wonderful. I think your bag looks great! I'm from the UK and I love about 20 miles from Prince Charles! Thanks for the chance, they are devine! Your bag is very pretty. Thanks for all the tips. I plan on making one soon. I've been making tote bags for my sisters and friends these days. Time to step it up! Did you know the George Muller built 5 large orphanages without ever asking for money outside of his prayer to God and while being a poor man himself? I thought this was interesting when I saw a movie about his life. Beautiful fabric. I am still terrified to try my hand at a bag. This is great, though. Thanks for the chance! thurbs8(at)yahoo(dot)com. My hubbie and I dated for a year when I was a senior in high school and a freshman in college. Then we didn't see each other for 9 years! Ran back into each other and 1 1/2 years later we were married! I live in Ireland, was born in England and have an American passport! Wow, I didn't even know kathy miller had fabrics ! I've always admired her artwork and their company used to be very close to where I live ! Thanks for the giveaway ! thank you for adding the "next time" comments. I always wonder what an item is like after it's been used some. Thank You! so useful! Oh, I've always loved Kathy Davis cards and have her birthday book/ greeting card organizer, and got one for my mom, too! Thanks for a chance to win this gorgeous prize! Did you know that blue whales are the largest animals ever? Even larger than the largest dinosaurs were? Your bag is gorgeous! I'm glad it works well for you!! Is it a cross-body bag? Hmm...something interesting about me...well, I graduate high school on sunday!!! The Kathy Davis prints are beautiful, I'd love a set for myself! Love your purse. I do not use one any more since my shoulder started giving me trouble. The fabrics are beautiful. Thanks for a chance to win. I need to stop check these blogs, get dressed for the day and get going but what a great opportunity to visit so many great sites and see so many ideas. I've sure had fun. Oh my gosh I LOVE that purse. I still need to find money to buy that book you got the pattern from. I've seen so many adorable things made from Amy's book. Your purse is beautiful. The fabrics are gorgeous. What a great giveaway. Hmmmmmm something interesting about me? I got to "retire" when I was 43 yrs old. :) Unfortuntately it was because of health problems but it still means I can sew all day long if I want to so that's a big plus. Something interesting, hum...my sister got married this past Saturday. It was a very exhausting experience. Yesterday at work, my building received a bomb threat, and we had to evaucate by word of mouth. Very scary! Thanks for visiting my blog and hosting your won giveaway, great fabrics!! What a great giveaway! I love these fabrics. Thanks for participating in SMS Giveaway. Well, I don't know how interesting it is, but my one year old computer died last night in the middle of visiting all the SMS giveaways. I've now been on the phone with Dell for almost two hours attempting to get it repaired. Using my old, ancient, slow backup at the moment while waiting for yet another callback. Yawn. Thanks for participating in the giveaway! I need fabric therapy to get over my computer stress. How does a tuba brush its teeth? Great giveaway! Thank you so much for this chance! I just taught my 9-year-old to sew yesterday and she loves it! End of random comment for the day! Very pretty! love that bag that you made! I'm waiting for baby boy to wake so I can spend ALL DAY flying home to Michigan from San Diego. Thanks for this giveaway. I love the colors in these fabrics! So pretty :) Thanks for the wonderful giveaway. great fabrics - I love those words! Something interesting? My family travelled a lot as a kid, so I've been to 63 countries and all seven continents.